Heeft u een vraag voor MG Hotel Apartment Grandview Mall Branch? Of u nu een toerist bent of een zakelijke reiziger, MG Hotel Apartment Grandview Mall Branch is een uitstekende accommodatie tijdens een bezoek aan Guangzhou. Het hotel ligt slechts 0.1 km van het stadscentrum: lokale bezienswaardigheden zijn dus snel te bereiken. Dit moderne hotel ligt in de nabijheid van populaire stadsattracties zoals Parc Centraal, Friendship Store(Grandview Mall Shop), Grandview Mall. Bij het MG Hotel Apartment Grandview Mall Branch staan de excellente dienstverlening en superieure faciliteiten garant voor een onvergetelijk verblijf. De topfaciliteiten van het hotel omvatten 24-uur roomservice, gratis wi-fi in alle kamers, wi-fi in openbare ruimtes, parkeerplaats, roomservice. Het hotel heeft 50 prachtig ingerichte kamers voor gasten, elk met plasma tv, internet (draadloos), airconditioning, verwarming, wekservice. Daarnaast garanderen de talrijke recreatieve mogelijkheden dat u zich tijdens uw verblijf kunt vermaken in het hotel. Het MG Hotel Apartment Grandview Mall Branch is een slimme keuze voor mensen die reizen naar Guangzhou: een ontspannen verblijf is gegarandeerd. Good hotel n location. No room service buy staff attended to our needs promptly. Staff are polite. Have washing machine but no dryer. We requested some hangers and rack to dry our clothes as we are staying in China for two weeks, didn't bring a lot clothes for changing. However the staff are friendly. if you lucky you will get the good room. our first night us not good as the room condition is not ready to stay. The light are not function but second night is very good but don't expect for 4 stars service. Staff cant speak English much but they are very sincere and helpful. 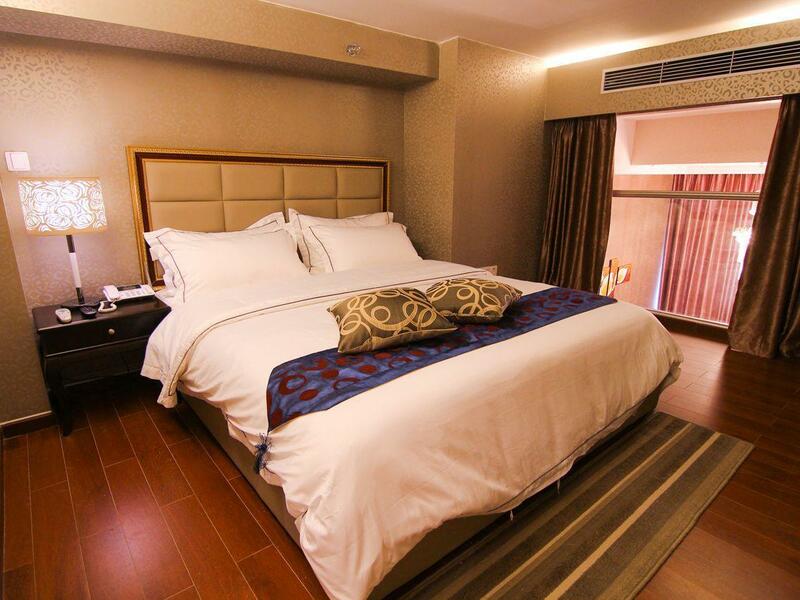 Its very convenient as located next to grandview mall and marriott hotel which easy to find. 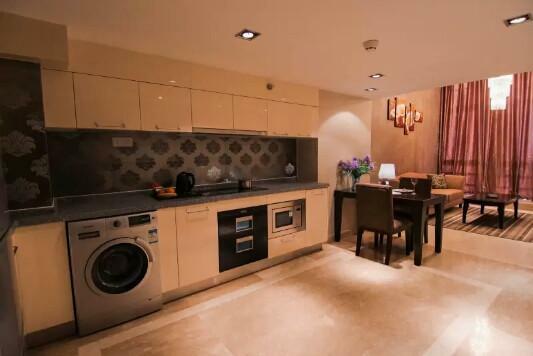 located at the center of tianhe, near to the subway station, surrounded with shopping mall. not really easy to find the hotel. hotel didnt provide any cooking stuffs even it's a hotel apartment. aircond not cold enough. I was a little worried at first but wow the Apartment was lovely. this Apartment is next door to a big shopping mall and not too far from the Subway metro line and station markets. I will use this Apartment again if I have the opportunity. (1) Best location- easy shopping, (2) big rooms, (3) wifi available. Generally satisfied but (1) no room to room phone line, (2) when i checked out at 11.45am on 01.12.2014, only 1 staff at counter, she was busy answering phone so we had to queue and wait a long time to get our deposit refund. 1.Good Location 2.Easy to buy food stuff from Supermarket to cook. But the utensil is very limited.Only have 1unit Pan.You need to buy of you really one to cook. 3.The problem of the staff is English communication. 4. Although you have fully settled the bill through Agoda,you still needed for the deposit 300yuan.But they will refund upon check out. I stayed here few nights for Canton Fair. Great location as near to few shopping malls. No problem getting meals everyday. They offered free shuttle bus from Hotel to Canton Fair as well. Nice bed and clean. We booked a non-smoking room and requested higher floors and 2single bed at the 2nd level. when we arrived, they gave me a room at level 25 which is not on a higher level, I saw a cigarette tray on the desk and I smell cigarette in the room, it was obvious a smoking room! And for the bed, one is at 2nd level and the other is at level 1. the toilet at level 1 flooded with water when the guests next room uses the toilet. We requested change of room and they said they will inform us they got available room and thru out the 4night stay, they never bothered to change the room for us! I will not recon MG hotel to any of my friends and I will not stay there in future. This is a simply apartment style hotel without much facilities. The good thing is that the location is great, near to Malls and MRT and value for money. The staff are friendly but they mainly speak Mandarin. 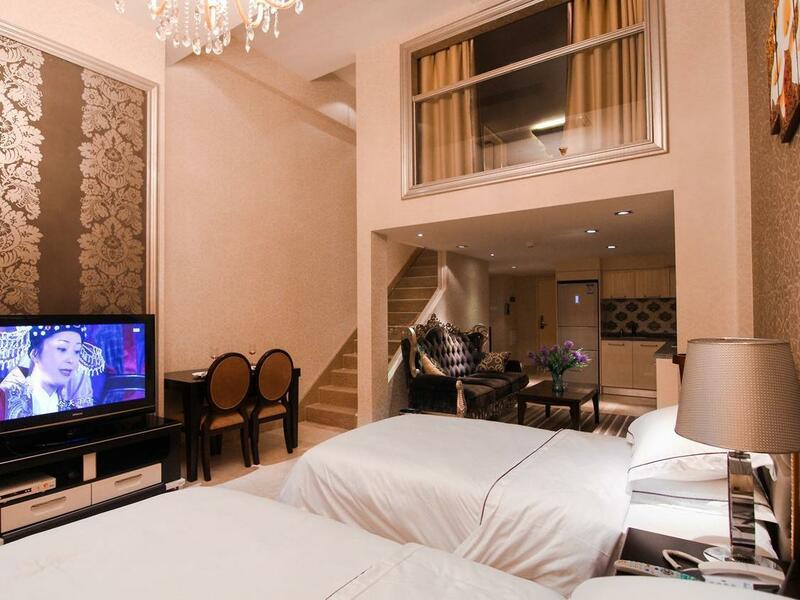 The hotel is located in the center of Tianhe area. Close to the mall and the MTR. The room is of a good size with one room below and another room above. Cleanliness is an issue as we found smelly towels and stained bedsheets. The room has washing machine (smelly on the first wash) and small pantry/kitchen area. 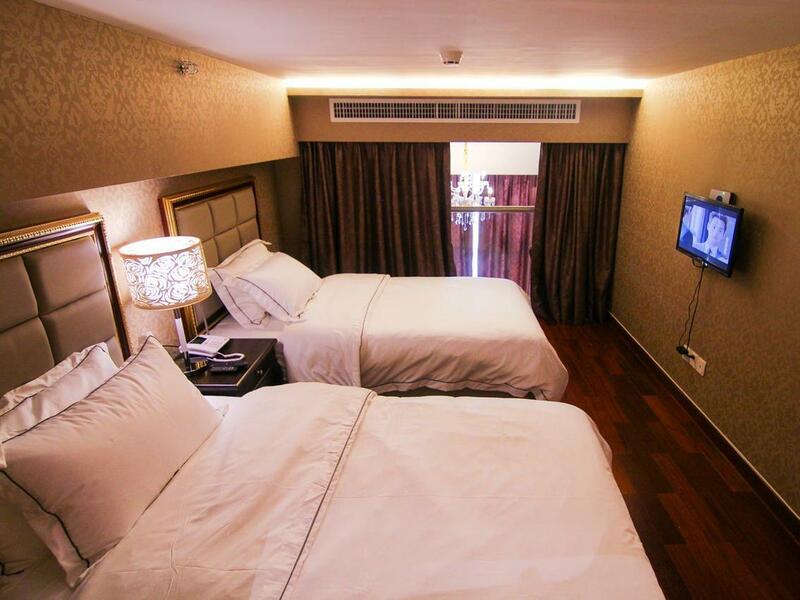 The hotel is located at the center of Tianhe area. Easy to walk around to the mall and MTR. But the entrance is hidden, taxi must stop at Marriott Hotel lobby. The room is a good size, however the bathroom was disappointing on the 3 bed duplex, room no. 3214, there's 1 shower bathroom only, the other bathroom only contained toilet bowl and washtable, and the glass door was put wrongly, the side with the shower head was not covered, so water was spraying all over the toilet bowl area and all over the floor on the supposed dry area. Towels were smelly and we found one already had holes on it. Bedsheets had stained on it. Overall cleanliness was not so great, found and killed 2 small cockroaches while there near the kitchen sink. The location and price were the winning value on this one. It was perfect! The hotel is right next to Marriot and I guess they are sharing the same building, amazing night view from the 26th floor. The Duplex design is magnificent! I will definitely stay again in MG Hotel. However, the down sides are the problems of waiting lift and also the water is a little bit flooded when you shower for over 15 minutes. But overall it's good. As in my title review, the standard of this hotel is deteriorating rapidly Stayed 4th times in this hotel. No shuttle bus anymore to the exhibition No eating utensil in room, you had to RENT them and pay the rate daily No breakfast as usual (IN ROOM) Aircon in the 1st floor is not cold, and they cant fixed it, and also they cant move us to new room Aircon in lobby switched off, so if you wait for lift, prepare for warm weather. All and All, this hotel location is very nice, and room standard are quite ok. Its just all the facilities that used to be here, now they are not there anymore. OK hotel for location. easy access to malls and local restaurants. Easy access to subway (East Railway Station) There are many malls around in walking distance. The room itself was okay except for the cleanliness. We found a bunch of hair on the sink and also a small cockroach. No bus to canton fair is offered so you need to take taxi but should cost about 20RMB only. it is nice. but the wifi sometimes too weak and the towel is a bit dirty. the room is big and the prices for the hotel is fit. around 500元 for 1 night with double bed. i like this apartment. but improve the cleaning service for the room. 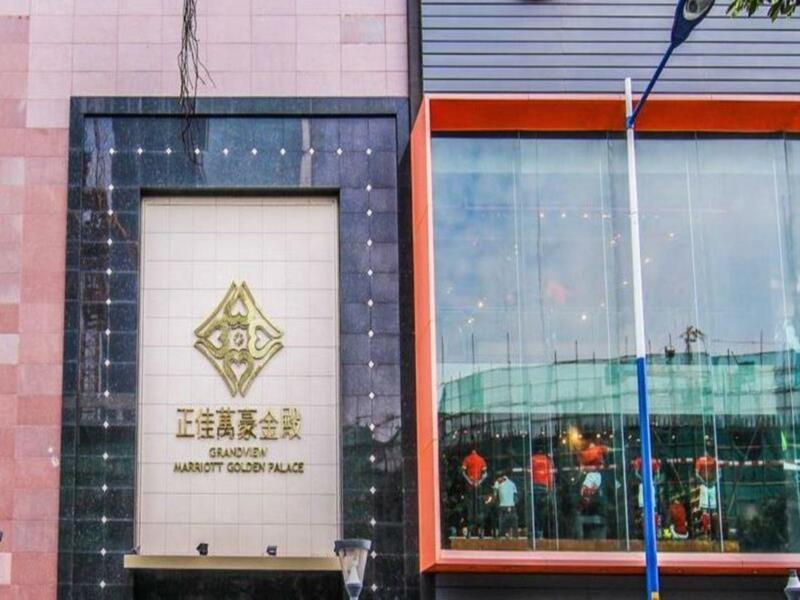 It is centrally located in Tianhe District, ideal for shopping lovers. The room duplex design is good, but letdown by its poor maintenance. This is my 2nd visit and always had rooms that has different plus & minuses.